After guiding the team to an exciting tri-nation ODI series triumph, captain Mahendra Singh Dhoni made it clear that he is ready to play "boring cricket" while chasing low scores if it ensures a victory for his team. "At times in these low scoring matches, you need to play boring cricket. It doesn't matter whether you win in the 48th or 49th over," Dhoni said at the post-match media conference having got his team past the finishing line with two balls to spare. The skipper admitted that since it was the final, he took the risk of playing despite not having fully recovered from his hamstring injury. "Sometimes you don't really wait to be 100 hundred percent fit. The problem with hammy (hamstring) injury is that there is a chance of re-occurence. Since it was the final and we have two months off after this, I thought about taking the risk," he said. Questioned on how he played despite restricted movements, he answered, "I just tried to avoid the pressure on my right hamstring and trying to deviate that pressure." 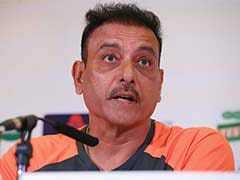 He was all praise for young Virat Kohli's leadership skills. 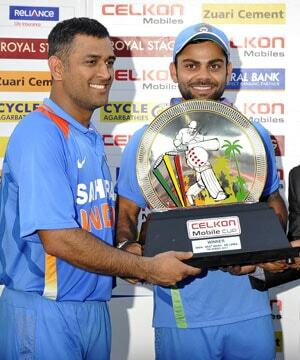 "Virat did a tremendous job with a young side. Now he will be leading the team to Zimbabwe where it will be a good exposure for the new set of bowlers who are not as experienced as the current crop. If they do well, our bench strength will only increase," the skipper pointed out. The witty side of the skipper came to the fore when asked about him scolding Ishant Sharma for misjudging a single and risking getting run-out in the process. "The problem with tall fast bowlers is that there is a lot of distance between the brain and the receptors," Dhoni answered in a tongue-in-cheek manner. On a serious note he added, "I was avoiding singles in the 49th over because if I had to play the last couple of deliveries and I happened to miss it, it would have increased pressure on Ishant. He is not very good at rotating strike and also with him I could have at the best run a single." The skipper was all praise for the tail-enders, who despite not scoring too many runs consumed a lot of deliveries. "Credit to Bhuvi as he played atleast 6-10 deliveries from Malinga which meant that the next two batsmen didn't have to face too many deliveries from Malinga. It was an interesting match where frankly speaking we were not in a good position. I wanted the tail-enders to stay as long as possible which would give a me a chance." Rohit Sharma has evolved in the role of an opener and the skipper is extremely happy with the talented Mumbaikar's performance. "Rohit has been brilliant and looked very confident from the start. It's always good to see him score runs. It helps the middle-order when he scores but some of the shot selections weren't great." About Jadeja not getting to complete his quota of 10 overs, Dhoni explained, "Since two left-handers (Sangakkara and Thirimanne) were playing I thought that it is better to continue with two off-spinners Ashwin and Raina. Also I gave Virat a few overs since the ball was semi-new. For me it was fine to have done away with two overs of Jadeja," he concluded.